The oral traditions of Native Americans are historical content that most academics refuse to reference, even in the face of startlingly accurate perceptions of early earth conditions and human occupation. This is most apparent from an anthropological perspective when we seek to understand the great antiquity of the Maya, one of the most misunderstood and thought-provoking cultures from Central America. What little we do know about the early Maya comes from the Spanish, the few sacred books (codices) that were spared in the genocide, and recent decipherment of stela (standing stone markers.) Arriving in the New World seeking gold and new lands for the monarchy, the chronicles of the Spanish conquistadors described the ruins of magnificent cities, strange observatories for scanning the heavens, and pyramid complexes abandoned years earlier. In their ignorance, the Catholic priests who made the cross-Atlantic journey murdered anyone who resisted religious conversion, and in what can only be described as acts against humanity, destroyed or burnt all references to the Mayan past, including codices, technical manuals, and volumes of scientific research perhaps thousands of years old. Who were the Maya, a scientifically advanced civilization that seemed to have magically arrived in Central America? We now know the Maya are one of the earliest established people in the Americas, arriving thousands of years before the Aztec, Mixtec, Zapotec and other peoples. What we don’t know is how early they arrived, and from where. Recent dating at El Mirador, home of the La Dante pyramid complex in Guatemala, the largest in the Americas, reveals a date of 2,700 BC. But there are a number of odd facts about the Maya which are curious to consider. In many of their large and well-designed cities, the earliest and most magnificent architecture is the most sophisticated. The largest pyramids using the heaviest quarried stones and complex engineering are the oldest. It’s as if the Maya arrived at each location, (Copan, Tikal, Chichen Itza, El Mirador) with thousands of years of science and engineering prowess already intact. Or did they inherit their skills? Dr. Richard Hansen, noted archeologist and director of the El Mirador Basin Project, has studied the Maya for most of his adult life and has come to a number of critical conclusions which shed light on the antiquity of these fascinating people. First and foremost, the Olmec were contemporaries of the Maya and not the mother culture we’ve been led to understand. Hansen also believes that the Maya may have been the ultimate demise of the Olmec. There is evidence that the Maya, through various military campaigns, destroyed their cities, most notably, La Venta. In a new geological study on surface features covering the Yucatan Peninsula, scientists have uncovered evidence of ancient tsunamis which passed inland as recently as 1,500 years ago and may have continually come inland thousands of years earlier. The destructive force of these 20-to-50-foot-tall (six to 15 meters tall) tidal waves was enough to topple buildings and drown anyone in their path. 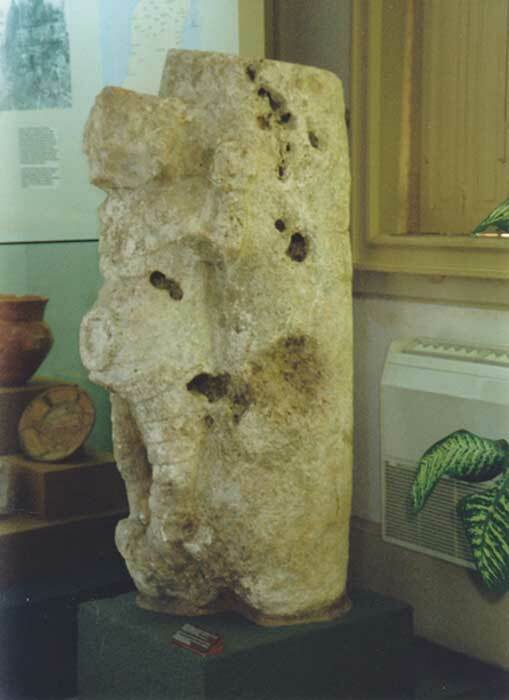 During my first visit to Yucatan in 1995, I discovered evidence of water damage to buildings, statues and massive destruction throughout much of the peninsula. Today, this evidence is still apparent at most of the noted ruins, including Chichen Itza, Coba, Uxmal and smaller cities scattered across northern Yucatan. When you take a multidisciplinary scientific approach to Maya building and construction techniques, you discover a civilization that conceived and engineered entire cities with a high level of precision, similar to early Roman architectural design throughout Europe. American forensic engineer, Jim O’Kon has spent over 40 years uncovering the genius of Maya engineering and discovered that versatile cement, vaulted ceilings, and roads were all conceived to withstand the elements and last for centuries with a minimum of maintenance. I was startled at the appearance of pyramids, ball-courts, and acropolises reduced to hills of stones, entire complexes buried underground, and buildings heavily damaged by the force of powerful waves and undercurrents. This is also evidenced in the early photos that were taken as Maya cities were excavated, consolidated, and reconstructed. Local museums are filled with artifacts and stone sculptures damaged by the corrosive action of salt water and the added pressure of being under huge volumes of water for long periods of time.